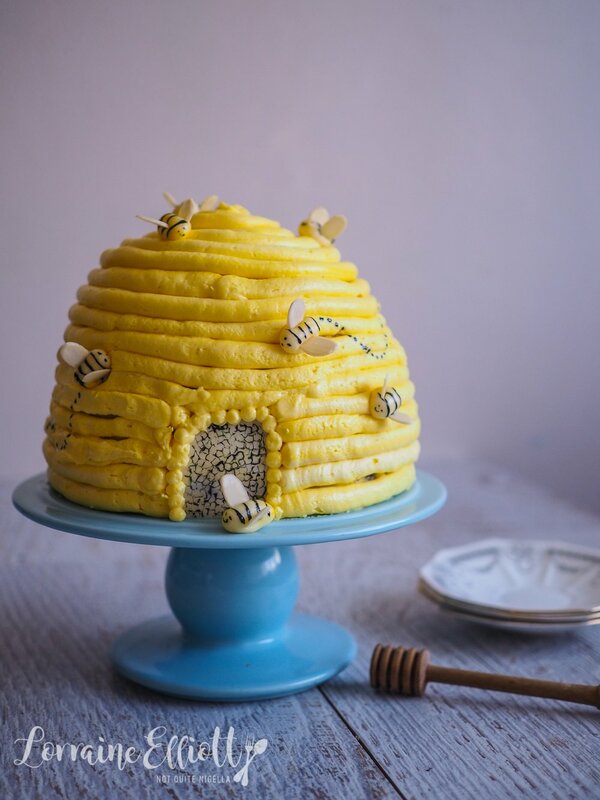 This cake is sweet as honey. 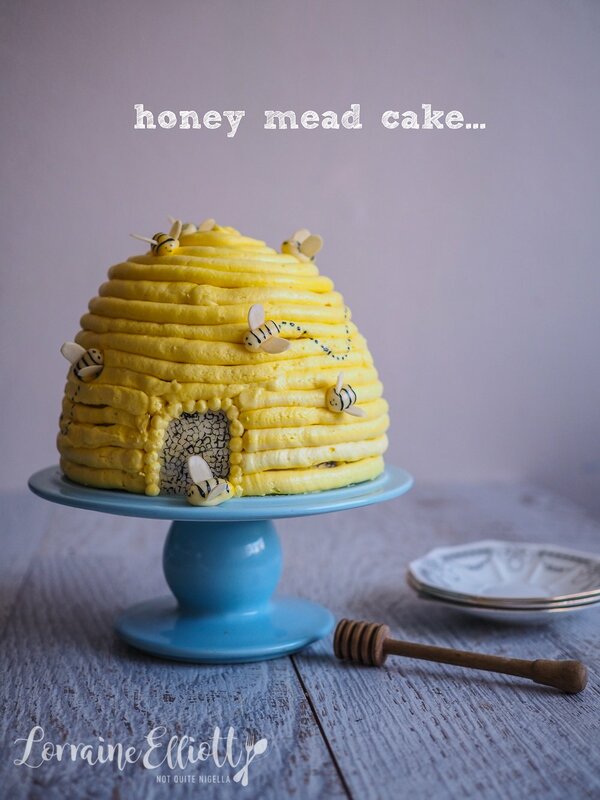 All you need is a pudding basin to make this surprisingly easy honey mead bee cake! 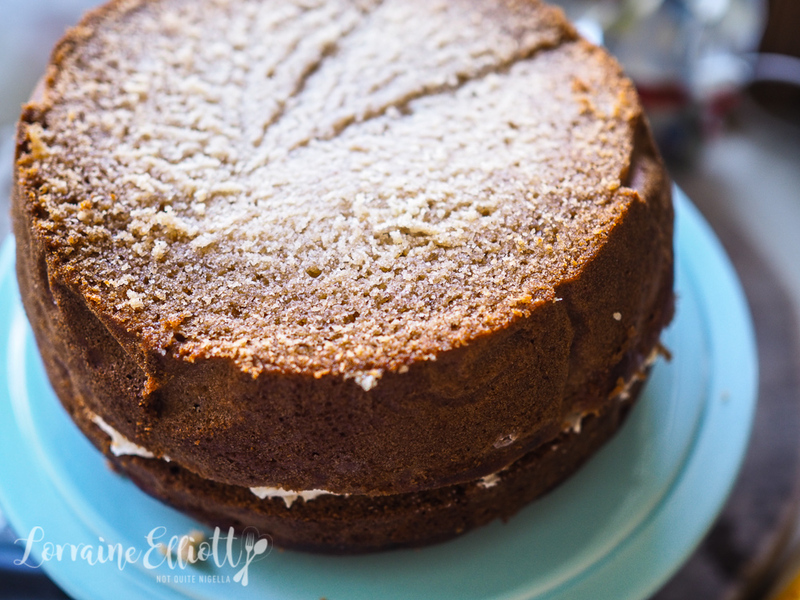 With a cinnamon scented mead and honey cake base, the cake is covered with a delicious salted honey buttercream! Although this is a novelty cake, I have to urge you to give this cake a try. The mead, honey and cinnamon give this an almost banana/carrot cake sort of quality. 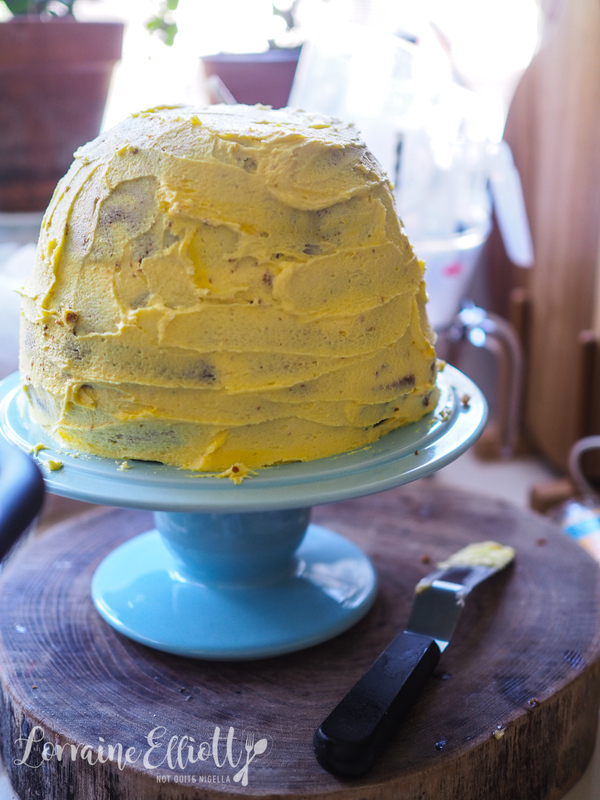 It's rich, moist and dense and the American style honey buttercream is just the sort of thing that dreams are made of. I can't believe this is the first time I've tried honey buttercream but it won't be my last. I made this on a busy cake week. I was making two cakes for two little boys. This cake was going to baby Henry who was turning 1 year old on Saturday. I made the cake on Wednesday, let it firm up and then cursed the weather because this was going to be covered in buttercream and we were about to have a 38C/100F day. The freezer was my best friend and once it set in the fridge, I covered it up and stashed it in the freezer. On the morning of I took it out of the freezer that morning and it defrosted on the trip to Manly to Louise and Viggo's house and by the time it was served it was ready. The party was full of children and adults most of them familiar to us as we've seen them on birthdays, Christmases and other occasions and it was nice to catch up with people although I spent most of my time eating and hanging out with Ivy. I told her that the cake had her favourite American style buttercream and she went back for more buttercream after the slices were meted out, once trailing her finger across the buttercream on the side when nobody but me was looking. We laughed so hard like complete buttheads. Then it was time for cheese after dessert. One woman sighed contentedly and said, "Is there nothing better than cheese and bread?". Ryan turned to her and said, "Yes there is actually, there's a lot of things that are better." My favourite past time is needling Ryan (it's mutual, we are like siblings that are forced together through family) and I rolled my eyes and told him that normal people usually agree with a statement like that and don't take it as a challenge to argue. "But there are better things!" he protested. Thankfully he didn't get started on my cake but honestly, sometimes brutal honesty can be hard to take! 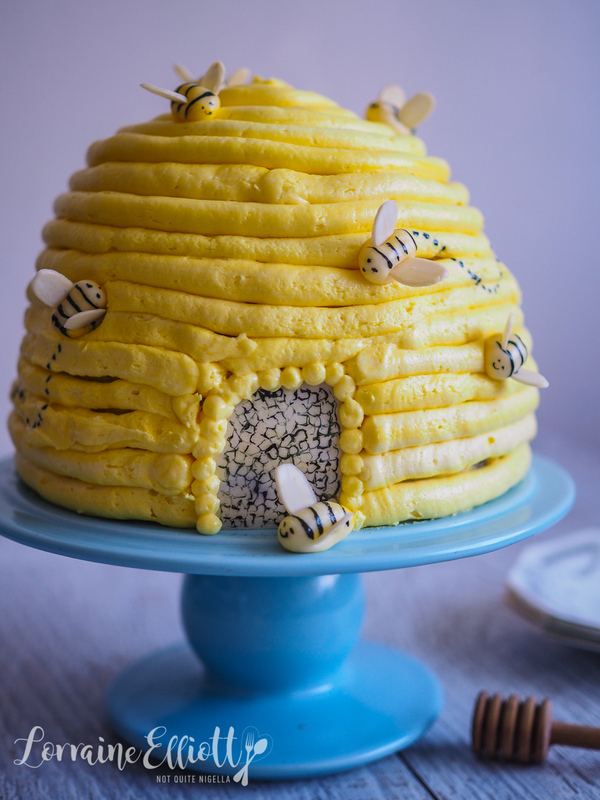 So tell me Dear Reader, have you ever tried honey buttercream before? And if someone said that, would you be inclined to agree or argue? Step 1 - Grease and line a pudding basin with parchment and preheat oven to 160C/320F. In a large bowl whisk the flour, bicarb, salt, sugar and cinnamon. In a jug measure the oil, mead, honey and buttermilk and whisk in the eggs. 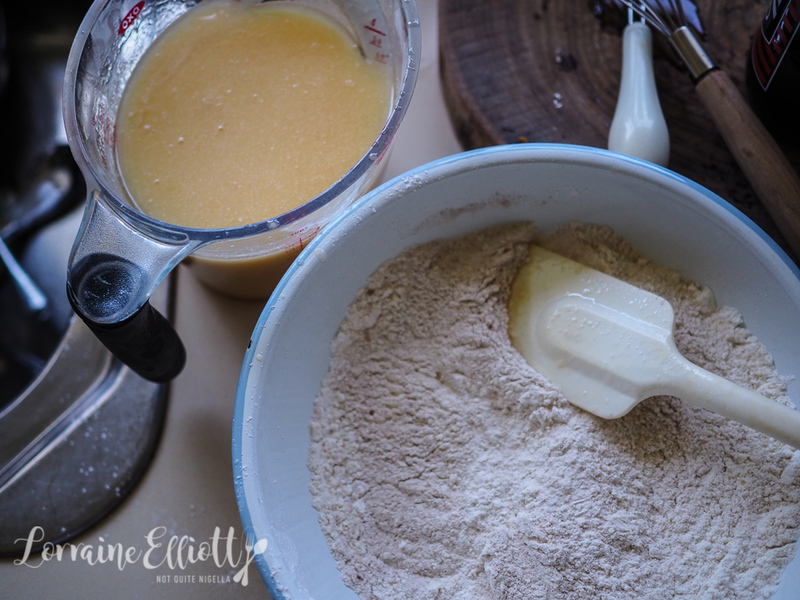 Make a well in the flour and slowly mix in the wet ingredients slowly using a large balloon whisk. 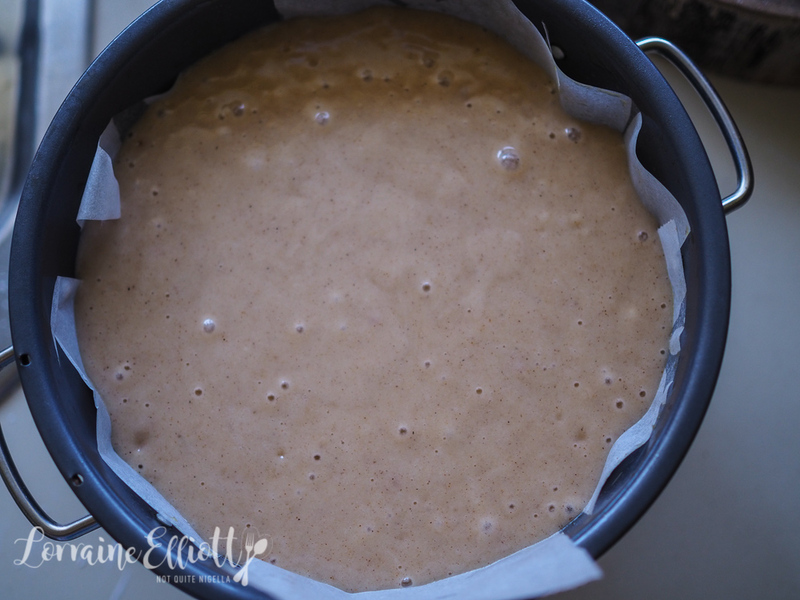 Step 2 - Pour into the baking tin carefully and bake for 1 hour 20 minutes or until the centre is done. Cool completely. Trim the cake so that it has a flat top (which will end up being the bottom of the cake). Step 3 - Make the buttercream. First beat the butter in a mixer until smooth. Then on low speed add the icing sugar, honey, salt and water and beat until combined. Then increase speed to medium high and beat for 5 minutes. 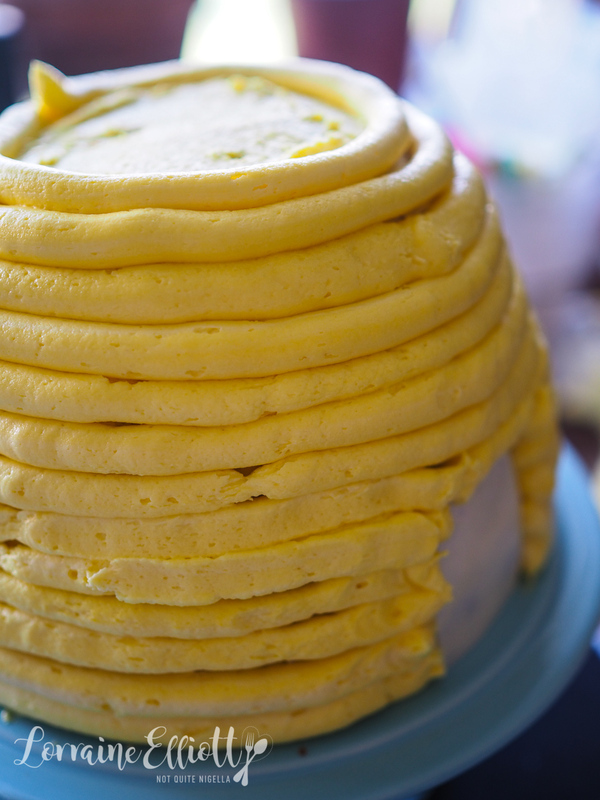 Add the yellow colouring to make a yellow buttercream. Make the honey syrup by whisking the water and honey together. Step 4 - Cut the cake in three parts across and place the largest disc on the serving plate. Brush with honey syrup and then spread with buttercream. Repeat with the other two layers and then spread a thin crumb coat of buttercream around the cake on all sides. Place in the fridge for 1 hour. Step 5 - Cut out a small door in the rice paper and affix this to the cake while it is in the fridge. Also make the bees. Roll out a pea sized amount of yellow fondant and shape into a small log. 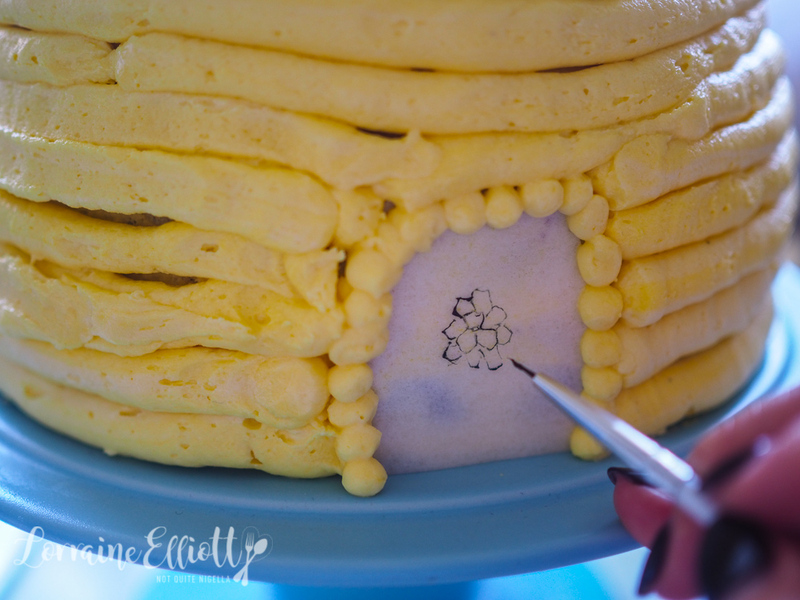 Paint stripes and a face on the bees in black gel and then insert the almonds as wings while the fondant is still pliable. Step 6 - Place some buttercream in a piping bag fitted with a #11 thermo tube plain nozzle and start piping a round from the bottom. I find this easiest to do on a cake turntable so that you don't break the piping. Repeat until you get to the top. Place in the fridge to set for 30 minutes. 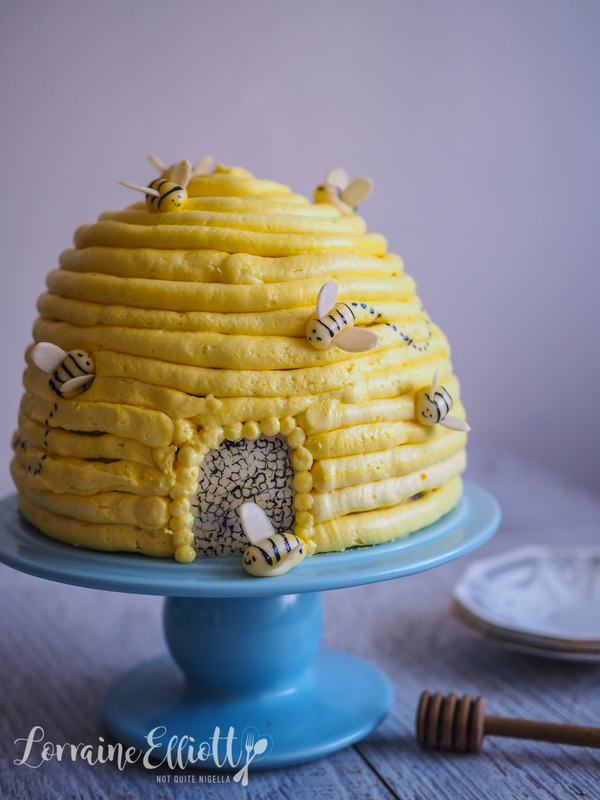 Attach bees to the cake and then draw little bee lines. 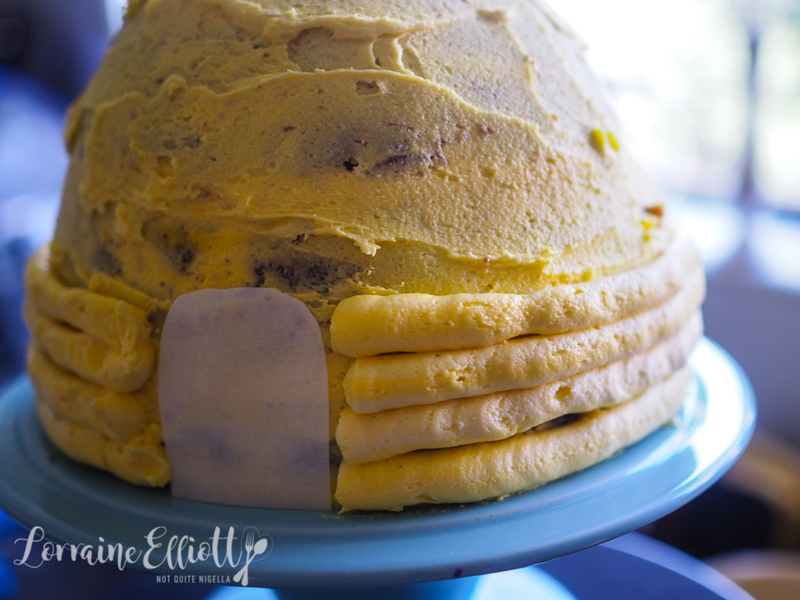 recipePamela, The Ombre Vanilla Cake With Tahini Orange Blossom Buttercream Frosting! recipe"Fireworks" Vasilopita New Year's Day Cake! recipeSpringtime Strawberry Cake with Buttercream Roses! recipeOuter Space Cake For a Birthday Boy! recipe"You're My Unicorn" Rainbow Cake! recipeTutorial: How to Create An Amazing Floral Painted Cake & Video! recipe Pamela, The Ombre Vanilla Cake With Tahini Orange Blossom Buttercream Frosting! recipe "Fireworks" Vasilopita New Year's Day Cake! recipe Springtime Strawberry Cake with Buttercream Roses! recipe Outer Space Cake For a Birthday Boy! recipe "You're My Unicorn" Rainbow Cake! recipe Tutorial: How to Create An Amazing Floral Painted Cake & Video!